It was the first of January 1924, Hidesaburō Ueno who was working as Professor in the University of Tokyo, wanted to buy a New year gift for himself. He went to a nearby pet shop and bought a two months old golden brown colored Akita breed puppy. He named his little pet Hachiko'. In Japanese, 'Hachi' means number 8 which referred to the birth order of that puppy and 'Ko' meant 'Prince of Duke'. As days passed by, Hachiko and the professor became very close friends. Daily morning, Hachiko would walk along with his master till the nearest railway station, from where the Professor used to go to his work by train. In the evening, Hachiko used to come to the railway station around 5:30 and wait patiently for the professor. Professor Ueno would return by the 6 pm train and then they both play with each other and return back to home. This happiness lasted only for one year. One evening, Hachiko was waiting for it's master but the professor didn't come in the 6'o clock train. Hachiko was worried since the Professor didn't come even in the next trains. He kept running here and there. Unfortunately, that afternoon the professor had died because of cardiac problem. The poor little dog didn't know this. For that whole night, Hachiko was waiting in the station for his master's return. Days passed by, but Hachiko didn't forget his loving master. He kept waiting in the railway station for the professor's return. People coming to that railway station started noticing Hachiko and came to know about its story. The news spread all over the town. Many wanted to take Hachiko to their home, but Hachiko refused to go with any of them. Every time when a train reached Hachiko would run all over the train expecting for its master. This continued for more than a decade. Then one day, when waiting for the professor , Hachiko died in the railway station. The people of that town were astonished by the loyalty of Hachiko. 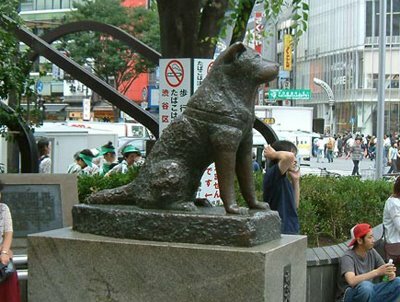 Then the people and the officials constructed a statue in remembrance of the world's most loyal dog Hachiko. Hachiko is really a faithful dog. We can see many types of dog in this world, they are different from their race, color and behavior. They are really loyal animal found in home. Hachiko is become famous in his loyalty. This is great tribute for him. Thank you for this great, I really impressed by your write up.